Where transformational leaders are able to inspire followers to change expectations, perceptions and motivations. A key insight from research, and explored in our book, is that much of the definitions to describe ‘management’& ‘leadership’ do not come anywhere near to describing what those people responsible for the work and performance of others do when they are highly effective. The opportunity for all organisations is that those ‘highly effective’ Leaders’ and Managers’ approach and their skills are readily shared and trainable. 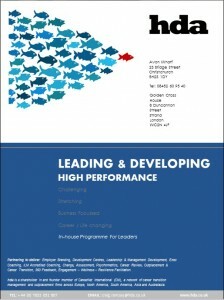 Book: Insights and principles shared in our book Leading & Developing High Performance underpins our programme. We recognise in today’s environment the traditional process/skill of managers of planning, organising, directing and controlling simply isn’t enough for your organisation. Instead you need leaders who can cause high performance to happen – and they do this by having the right mindset, having the right skills and following the four-step leadership process. 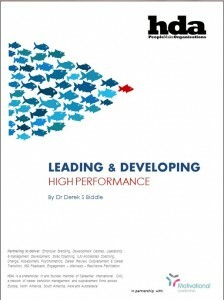 Leading & Developing High Performance (LDHP) draws on research of what effective leaders, across a variety of industries, actually did when creating high people and organisational performance. The approach is based on our HR/Learning & Development book titled: Leading and Developing High Performance. The genesis for this book came about through researching highly effective leaders. The identified best practice was ‘captured’ with the intention of making it available to others. Our experience since with hundreds of managers is they strongly identify with the approach, and find the techniques and practices meaningful, practical and readily applicable. We share the successful methods, enabling your people to meet organisational needs and work within the context of today’s rapidly changing world.